On May 3, I took a trip to Kansas City and then on to Lincoln, Missouri, to examine the in place occurrence of Mozarkite, the Official State Gemstone of Missouri. As part of my ongoing study of cryptocrystalline and amorphous quartz family gemstones, I thought that the Mozarkite mine would be a worthwhile trip. In Kansas City, I joined up with Bill and Betty White on Friday afternoon. Bill and I spent much of the afternoon at one of the major tool houses there and I purchased quite a few diamond tools and other tools that would be of use for stone and metal work. We also hit one of the retail salvage outlets, a store that carries distressed merchandise, as they often have many tools of considerable value for very low prices. On Saturday morning about 7:00 A.M. we left Independence for the small town of Lincoln, Missouri. The town is famous for its annual rock swap in September. There we teamed up with Linville Harms, owner of the Mozarkite mine, and then went on to the mine. The attached photos of the Mozarkite and the Mozarkite mines help you get a better idea of what the site is like. Mozarkite is not an accepted mineral name but is simply a trade name that was developed to promote the acceptance of the stone as Missouri’s official State Gem and to generate sales to both lapidary and tourists. The name has found acceptance in some circles but is not an acceptable mineral name in others. Mozarkite has formed in place in marine sedimentary rocks of Ordovician age — it probably is most common in the Jefferson City Formation. The Jefferson City Formation is comprised mostly of dolomite with silty and cherty stringers running through it. There are very few fossils in dolomized rocks as the addition of magnesium to the calcium carbonate of the limestone usually results in complete re-crystallization of the rock and destruction of any fossils or sedimentary structures therein. We did observe a fragment of a brachiopod shell that escaped destruction. It appeared to be a flat-shelled, long-hinge lined form, probably a strophomenoid, but no other determination could be made of it. Much of the local lore about Mozarkite attributes it to igneous activity but there is no evidence for any in that area of Ordovician or younger rocks. The Mozarkite appears to be of strictly marine sedimentary origin. Some of the nodules show evidence of an accumulation of siliceous gel or ooze on their outer surfaces. There appears to be three different facies of Mozarkite. The gemmy kind is a dense, brittle form that shows no crystallinity at 10X magnification. A second kind is what the locals call “sugary” Mozarkite. Some of this is quite colorful and has interesting patterns and enjoys some gem use. The “sugary” kind, However, this does not polish nearly as well as the dense, brittle kind. Then, there are some nodules that appear to be very fine sandy textured. The three facies or textures of Mozarkite suggest that sorting of particles may have been one of the key factors in the origin of the material. Sorting of particles simply means that as some energy form such as wind or flowing water moved a mixture of unconsolidated particles, the heaviest or largest particles are the first ones to drop out of suspension. You can observe this phenomenon on the gravel bars of a stream or in the bars along beaches, estuaries, or lagoons. The coarsest particles will be on the upstream end of the bar or nearer the bottom of the bar. It may well be that the gem Mozarkite is a quartz argillite, a sedimentary rock made up of quartz particles of clay size, that is, smaller than 1/256th of a millimeter. The gemmy facies could also be derived from silica of organic or volcanic origin. The “sugary” facies is made up of the particles larger than 1/16th but smaller than 1/4 mm. The source for the silica that makes up Mozarkite is currently not known. It may have been from Precambrian granite rocks that are found to the south and east. Sponge spicules may have been the source of silica; I will not totally disregard them. However, I usually favored volcanic ash as the source of siliva for large bodies of chert or flint in marine sedimentary sequences. If there was any volcanic activity involved with Mozarkite, it was from volcanoes that were far away from the Mozarkite-bearing strata. To prove that, several things need to be done. First, properly oriented (top and north) nodules need to be collected from in place in the mine pits. 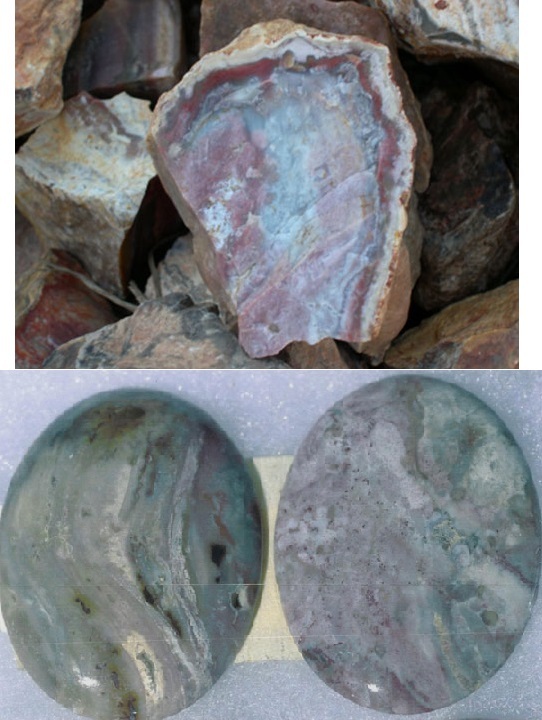 The nodules should not be examined in the field to avoid “high grading” the material. An outcrops map or diagram would need to be made that shows the places from which each nodule was taken. Similar sampling should be carried out from several different layers in several different parts of the mine. The facies of each nodule would need to be located on the map. Does one zone produce only sandy material whereas another produces only gemmy material? Or do these facies occur at random? Thin sections (30 microns) would have to be made. The nature of the particles (angular or rounded) and any cement between them would need to be noted. Is there a silica cement between the particles or does their angularity hold them together? Then other occurrences, both geographic and stratigraphic, of Mozarkite would have to be noted. The sedimentary structures in the Mozarkite and the host rock would also have to be observed and recorded. By the time all of this is done, one has done enough work to earn a Master of Science Degree. As you see, there is no easy answer for Mozarkite. Perhaps, as a club, or group of clubs, we might think of funding a student to carry out the above kind of research. The Mozarkite Society of Lincoln, MO is having their annual rock show right now, from September 19-21. There is FREE admission! It is at the Lincoln City Park, Shelter House, behind Casey’s. Hours: Fri 9-5, Sat 9-4, Sun 9-4. Go to www.mozarkite.com for more information. Mozarkite is a variety of quartz that comes in many colors including red, pink, purple, blue, and white, usually in pretty swirls. The name comes from Missouri and Ozarks, which is where mozarkite is often found. It is considered a semiprecious stone because it has a hardness of 7.5-7.75 on the Mohs scale, making it hard enough to be polished and made into jewelry. Mozarkite has been Missouri’s state rock ever since 1967.